This post is a high-level overview of how I made $25,000 from Crude Oil futures in just 11 calendar days. If you find it helpful, please share it on Facebook, Twitter, and LinkedIn. A little backstory: When I first started trading, I was always searching the Internet for stories of successful, independent traders who weren’t trying to sell me a subscription with their trading secrets. I really couldn’t find any. Hence, I love writing posts like this. Hopefully, this post can provide useful information about day trading futures and serve as a form of trading/investing inspiration. It is indeed possible to make $25,000+ in less than a month on a relatively small trading account. Before you begin trading, you need to pick an asset to trade. Often times, selecting a product or asset class to trade is the most confusing part of trading, especially if you’re new. Of course, there are other asset classes out there that present opportunities to make money. The reason I exclusively focus on these six asset classes is not that I’ve found it too overwhelming or intimidating to watch all areas of the market. Rather, these asset classes are all highly liquid, capable of high amounts of leverage, somewhat volatile, and relatively easy to understand. Within these asset classes, I’m indifferent to the particular products. I like to keep it simple. It doesn’t matter to me if I make money from NYMEX Crude Oil futures or CME Bitcoin futures; making money is making money. 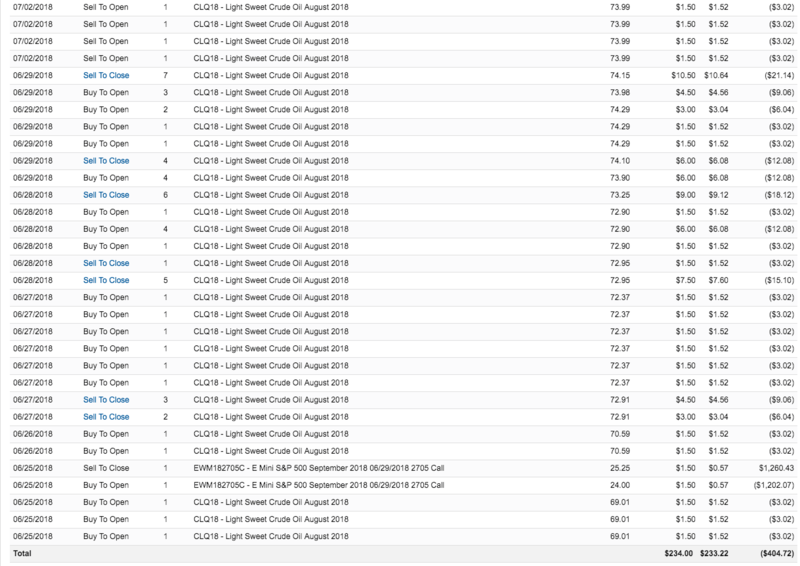 For the trades I made in the past 11 days, I traded Crude Oil, and I cashed out with $26,816.92 in profits. I only started with $14,000 in my account. I traded one bitcoin futures contract to see what it was like…and it wasn’t that great. Both Light Sweet and Brent Crude Oil have had an epic run as of late. Both futures have made new multi-year highs in the past few weeks. The main reason why I like trading NYMEX Light Sweet Crude Oil Futures is due to leverage… lot’s of leverage. With only $3,000, it’s possible to establish a meaningful long or short position. For every $0.01 that crude oil goes up or down, you’ll make/lose $10. So if you’re long 1 contract and crude oil jumps $0.50 in three seconds after a bullish EIA report, you’ll make $500. If you’re long 5 contracts, you’ll make $2,500. Although it depends on your broker, it generally only takes $15,000 to trade 5 Light Sweet contracts. The price action highlighted in the blue circle above is, in my opinion, a price extreme. Any time prices reach multi-year highs or lows, there is opportunity. Let’s dig deeper. Jim Simons, one of the most successful hedge fund managers in Wall Street history famous for implementing quantitate trading strategies to make extremely outsized annualized returns for over 30 years in a row (he honestly puts Warren Buffet to shame, in my opinion), gave an interview with Numberphile where he stated something interesting. I love what Jim said here. It’s a very true statement. This is why trading is so difficult; there is a mental component. Sometimes it works, and sometimes it doesn’t. And depending on the outcome of a trade, it is bound to affect your mindset one way or the other. This particular quote doesn’t have too much to do with this set of oil futures trades, but it is profound nonetheless. Jim went on to describe how his hedge fund, Renaissance Technologies, profits by identifying anomalies in the markets. Periods of extended gains, like two consecutive daily gains in crude oil of 3%, are anomalies. They are not the norm; this type of stuff doesn’t happen often. Coming from someone who has made over $20 billion from the markets, this is an absolutely fascinating statement. Clearly, Jim has done something that’s worked extraordinarily well. My experience is nothing compared to Jim’s. Absolutely nothing. I am a peon and Jim is a market deity. Nonetheless, I think good ol’ Jim is on to something with his commodity analysis. So, if we know that trends in commodities are anomalies, even if Jim discovered this fact many years ago, how do we take advantage of an anomaly? Simple, you join the trend. Fighting the trend in the markets has never worked for me – ever. I’ve never been able to call a distinct top or bottom in any security. Even though NYMEX Crude Oil futures reached just reached a three-year high before I started to buy contracts, I had no qualms buying 3 to 13 contracts at a time over the next few days. To place these trades, I used Charles Schwab, and I paid $1.50 per contract. This NOT the cheapest rate in the industry, and Schwab also offers just about the worst trading user experience one could imagine. I had to enter my orders on a webpage that kept timing out from inactivity. So frustrating! Schwab doesn’t offer any futures trading platform, except for Streetsmart Central, which is total garbage. The mobile app is also a joke. Had I used tastyworks for these trades, I would have only paid $1.25 per contract and been able to use their free, robust futures trading platform with price ladders and level II market depth. For 2018, tatsyworks is the least expensive futures broker with the best trading platform. Since 1 NYMEX CL Light Sweet Crude Oil contract represents 1,000 barrels of oil, there is a lot of leverage with these futures. As mentioned earlier, this is the #1 reason why I like trading oil. This is the way I see it: because it’s so damn difficult to accurately predict the price of a commodity (or stock, or whatever), if I actually accurately predict the price, and I’m right, I want to win, and I want to win big. Meaning, I patiently watched crude oil climb two days in a row by more than 3% each day, something that doesn’t happen that often (an anomaly). I then determined that the odds favored further gains, as opposed to losses during this upward trending anomaly. Because, by definition, anomalies don’t happen often, I wanted to make a decent chuck of change if my prognostication was accurate. It was, and I made $26,800 from $14,000. Why plug away in the markets everyday chasing pennies, when you can intensely focus for a few days at a time and make a killing? 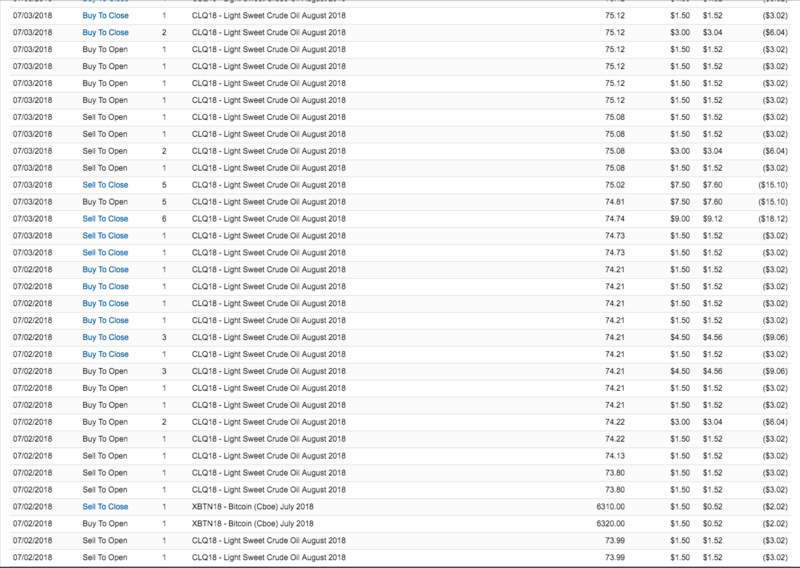 These are the confirmations of all of the trades that I placed to get to $26,816.92 in profits in just 9 trading days. For every trade I place, I always have an exit plan. When I first bought the three oil contracts on 6/25, prices pretty much increased immediately after my trade. This is an important lesson. I consider this a decent trade, and all of my decent trades are usually profitable within 30 minutes of establishing the position. It doesn’t matter what price I enter at, because if prices are moving the way they’re supposed to, the position tends to stay flat or be profitable very rapidly. On 6/25, oil just never seemed to have a downtick. Had oil started to sell-off, I would have exited my position. This is precisely what happened on 07/03. I was initially long 7 contracts around $74.29, and oil instantly plummeted to $74.15. I say “instantly” because it was one massive sell order that pushed the price down from $74.30 to $74.15 in less than a second. Since I was long 7 contracts, I lost $980 in less than a second, which always makes me feel alive. I ended up reversing my position, making money, reversing again, and establishing the original long position. 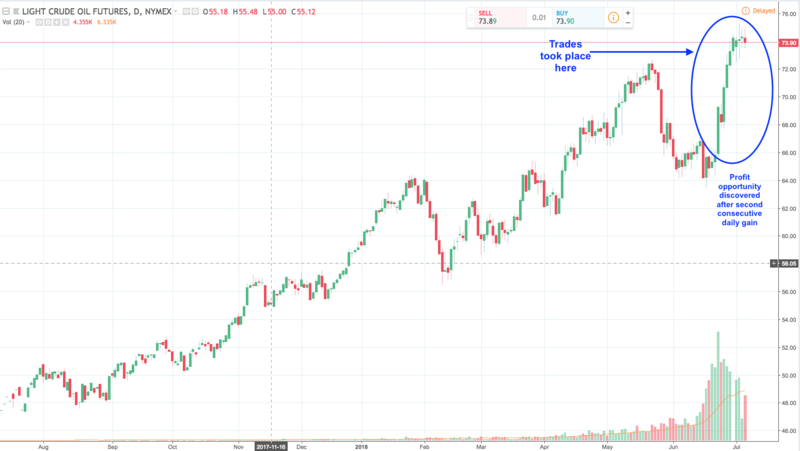 Recap: Why Trade Crude Oil? Anomalies are present in crude oil and leverage is high with crude oil futures. It’s that simple. Wait for an anomaly to occur, place your bet and hope (then hope again) that you’re right, because either way, your profits or losses will be huge with highly leveraged futures. Additionally, since the price of crude oil depends on supply and demand, as well as other geopolitical factors (like pipeline outages and political instability) prices can behave in the same manner for several consecutive days; I believe this is what Jim was referencing in his interview. Moreover, almost all crude oil traders (from hedge funds to individual investors) use leverage. Therefore, when these anomalies of consecutive one-direction price movements occur, amplified losses often exacerbate the effects, since traders need to close out their positions and buy into a rising market (or sell into a falling market). You have to be smart. You have to be nimble. And you have to be okay with *occasionally* having some losing trades. But making solid cash through trading is possible. Even if I was fooled by randomness, I have no problem being a fool with an extra $26k in my pocket.